The general population data underlying this study come from 106 countries for religious identity, 106 countries for the importance of religion, 105 countries for prayer frequency and 102 countries for religious service attendance. The countries where religious service attendance was measured are home to 70% of the world’s population (data on religious service attendance were not collected in India, Japan or South Korea).23 The countries in which the other measures were collected are home to 91% of the world’s population.24 In addition, Thailand’s Muslim population was included in the global analysis of Muslims, although Pew Research Center does not have nationally representative data for Thailand’s overall population on these measures. Global Survey of Islam (2010-2011). Results and methods reported in the 2012 report “The World’s Muslims: Unity and Diversity.” This report also used data gathered as part of the sub-Saharan Africa survey. Pew Research Center’s annual spring surveys that measure global attitudes in 25 to 40 countries also collect some data on religion. They measure up to four indicators of religious commitment: religious affiliation, prayer frequency, attendance frequency and how important religion is to a person. This report uses data on these indicators collected during the 2013, 2015 and 2017 global attitudes surveys for countries not covered in surveys that focus on religion. Details about methods used in the 2013, 2015 and 2017 Global Attitudes surveys are available online. Using all the above sources, researchers measured differences between younger and older adults in religious affiliation in 106 countries as well as by other religious commitment measures in 102 to 106 countries. (The number of countries varies slightly for each indicator of religious commitment because data on some measures were not collected in all countries.) 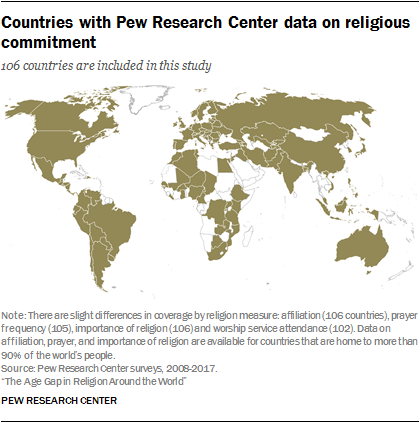 Together, results from these sources provide a comprehensive and up-to-date portrait of global age-related differences in religious commitment. In order to have sufficient statistical power to make comparisons, this report examines differences between younger (under age 40) and older adults (ages 40 and older) only if the sample size for a particular religious group within a country is at least 250 survey respondents. This report presents as statistically significant those differences between younger and older adults for which we can reject the null hypothesis of no differences between the two age groups with a 95% level of confidence. These calculations also take into consideration the survey design effects, which make estimates of significance more conservative. All differences at the country level have been tested for statistical significance, and the country-level differences presented in this report are statistically significant unless noted otherwise. In this report, data from each country are weighted equally without taking population size into account when calculating averages across all countries globally and in each region. Tests of whether age gaps in this report are statistically significant rely on weights constructed for each country that account for the design effects of clustered sampling units. However, appropriate weights are not available to evaluate the statistical significance of age gaps aggregated at the level of region, religion, or all countries combined. Therefore, to describe the statistical significance of results aggregated beyond the country level, the report relies on tallies of the number of countries in which there are statistically significant differences and countries in which there are no statistically significant differences. Partitioning the world’s adults into halves representing “older” and “younger” was done for the sake of illustrating broad trends in a simple way. The same general pattern described in the report still holds if the generational divide is made at a slightly younger or older threshold. Moreover, defining the transition from younger adults to older adults at 40 is not completely arbitrary. There are a few reasons this cutoff might be better than others. The differences in religiosity between older and younger adults might be due to changes over the lifespan, changes between generations, or (likely) both, so both processes were considered. Research, particularly in countries with advanced economies, has found evidence of changes in religious commitment across the lifespan. Religious identity and commitment may be in flux during young adulthood, with changes tied to major life events like marriage and becoming a parent. The age when people first get married and have children varies widely by region and religion, but a majority of people who will marry or have children have done so by age 40. Globally, percentage point gaps between older and younger adults are stable if the division is made at 30, 35, 45, 50 or the country-level median age instead of 40. Changing the cutoff point between older and younger results in no more than a 2 percentage-point difference in the average size of the age gap. The overall percentage-point gap between older and younger adults is the same on all measures if the split is made at 35, 40 or 45. If older adults are defined as those 30 years old or older, the gaps between age groups on weekly attendance and daily prayer are one percentage point smaller than if the split is made at 40, and the same gaps are one point larger if the split is made at 50 instead. 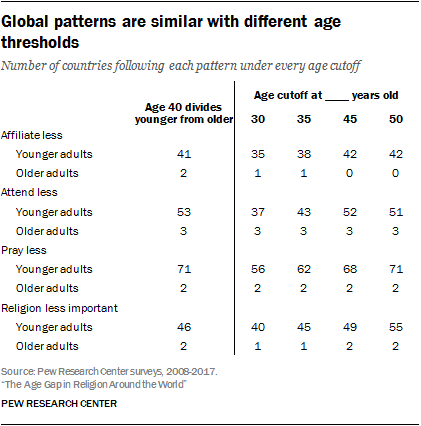 Comparing counts of countries that follow each pattern under different age-group thresholds also shows broad consistency. 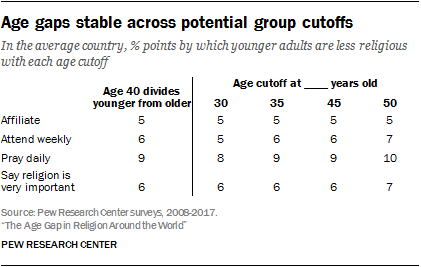 In the vast majority of countries where there is a significant difference, younger adults typically affiliate less, attend religious services less, pray less and are less likely to say that religion is very important, whether “younger” is defined as everyone under 30, 35, 40, 45, 50, or the country’s median age.